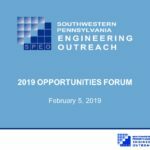 SPEO held the 2019 annual SPEO Opportunities Forum on February 5th. Representatives from local and state agencies discussed scheduled projects and forecasted procurements. To download a pdf of presentations from the event, click the image below. NOTE: YOUR FIRM MUST BE A CURRENT SPEO MEMBER FIRM FOR YOU TO DOWNLOAD THE PRESENTATION. MEMBERS MUST PROVIDE A PASSWORD TO OPEN THE FILE (the password has been provided to all members on our e-mail list by Feb. 8th. If you are a current member and need the password, please contact ssundin@hayesdesign.com). In addition, thank you to all of our sponsors of this event!